35 Comments As an Amazon Associate I earn from qualifying purchases. I have a baby shower I’m co-hosting this weekend. We decided to do it crazy pink. I’m really excited about all the the elements in the works. We are setting it up as more of a cocktail party than a traditional baby shower. We wanted to do a variety of pink flowers for part of the decor. I had seen these DIY painted sea glass on Pinterest, and I thought they’d be a lot of fun to try for this party. 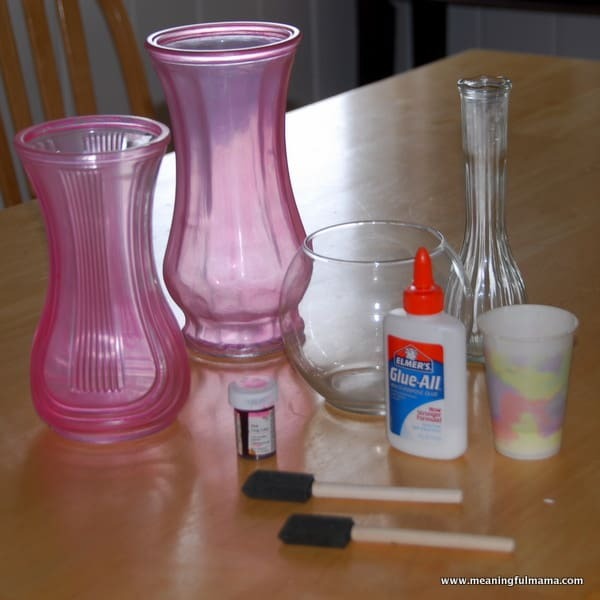 Materials needed: Old vases (Goodwill is always a good option if you don’t have some on hand), Elmer’s Glue, Food Coloring and Sponge Paint Brushes. You mix the glue with the food coloring to make your desired color. Add a little coloring to the glue, and then keep adding until you have the color you want. I put on the glue paint on around the lower part of the vase and the upper rim. 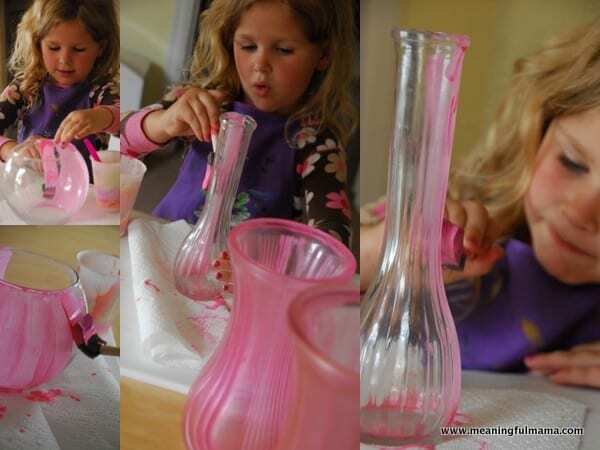 Then, you do smooth strokes all the way up and down the vase. I had Abby do the initial work on the vases while the other kids were sleeping. Then, I came back over with the smooth stroke to give it a more polished finish. It has been fun to see how much my kids can actually help at times. Before Meaningful Mama, I’d be doing this work by myself. 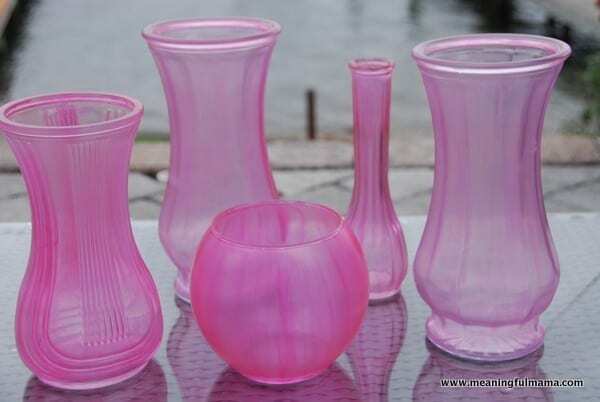 The great thing about these vases is you can make them in any color and any darkness. This was just one coat. The coat is on the outside, so you don’t need to worry about the water on the inside of the vase. Just try not to drip on the outside as you are filling it with water. I’m sure you could put some sort of sealant on to make them last longer. However, I had some drips that didn’t look good on one, and I was able to just peel of the paint and do the section over again. I love that if I wanted a different color, I can clean these up and do it again. We will be doing pink flowers for the party, but I only had purple in the moment, so that’s what’s pictured above. I love my readers. Thanks for helping! These are so pretty. What a great idea for a party. So pretty! I bet your girls really enjoyed helping you! I never would have guessed that wasn’t the way the glass came! I think they turned out really cute! I am definitely going to have to do some colored glass project soon. It’s been on my mind for a while. Pinterest is good and bad for me haha. Awwww…. 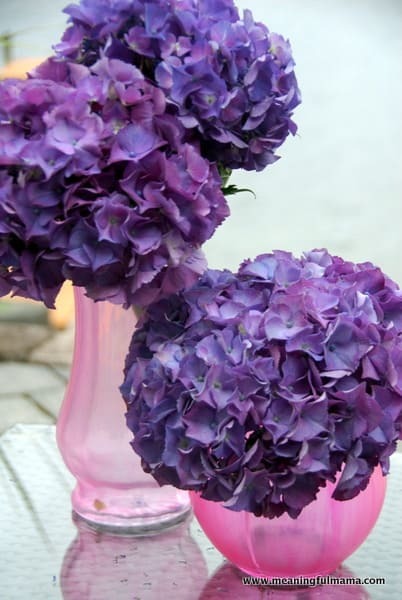 and Hydrangeas! Such a cute project 🙂 Like. What a fun and inexpensive idea! Sorry it has taken me so long to get back to you. I had one that turned out streaky. It seemed the ones that worked the best were the really cheap ones from your basic flower store bouquet. It seemed the thicker the glass, the better it was. I had one that I goofed up on, and I just peeled it off and started over. The streaks didn’t matter much when they were filled with water and had flowers. I hope that helps. How did you get the right shade of pink? I ysed red food coloring with the glue and it turned out orange. I have some really great shaped bottles that I want pink to be filled with big round bouquets of babys breath to also use for a baby shower. I actually used a pink color. Wilton has a variety of gel colors and pink is one of them. You can see the container in the second picture. Here’s a link to the product: http://www.newegg.com/Product/Product.aspx?Item=9SIA12E0M46363&nm_mc=KNC-GoogleMKP&cm_mmc=KNC-GoogleMKP-_-pla-_-Bakeware-_-9SIA12E0M46363 I hope that is helpful. I just wanted to thank you for sharing this project!! I tried it and my vases look so adorable!!! This was easy and breezy! I didnt even have to spend a dime!!! I had all the material at hand at my home which was awesome!!! thank you again!!! how do i post a pic? Thank you! Thank you for posting on Facebook too. The results turned out really cute! This looks like a ton of fun. I have a few glass jars that I’ve been meaning to craft with and I think this will do just the trick. Have you come across anything that makes a good sealant to prevent the coloring from coming off? I hope you have fun with this. I haven’t tried to seal it, so I’m afraid I’m not much help there. I have used them for events and then was able to peal it off to change colors for other celebrations. Sorry I don’t have more information for you. I read this technique a few days ago on Tiphero.com. They said you coiuld seal your jars with Krylon Clear which comes in a gloss & semi-gloss.You have to use several coats. Super helpful. A number of people have asked. I will add that to my post. Thank you for this information. Like this idea, someone told me about this and said if you put glass in oven at 350F for 1/2 hour it cures it. I haven’t tried it yet. You may be able to spray it with clear matte sealant to seal it too. Good ideas. If you do try that, will you report back? Thanks for the input. Thanks, just the comment I was looking for before I tried this! Can you spray it with a sesler so it don’t come off? I have never heard of sesler, so I’m not sure. I’d buy a dollar store vase and just try it. Would you mind reporting back if you do try it. I was wondering if u can use actual paint to mix with the glue? I have some beautiful colors and glitter. .. Think I may try it today….. I have to figure it out cause im Makin mason jars for our wedding this summer!! Any tips?? I’ve never tried it. Let me know how it goes. If the paint doesn’t work out, I’d just stick with the idea of food coloring. A little goes a long way, so I think it wouldn’t add too much cost, but I totally understand wanting to use what you have on hand. Happy wedding! will this work on plastic too? I have some plastic wine glasses and I love this idea. I have never done it on plastic, but I imagine it will work. If you try it, will you let me know? That said, I wouldn’t drink from it. It would look great, but I think the glue would come off in your mouth. Ooo – Fun idea. You’ll have to let me know how it turns out!